Sciblogs | Did dodgy rivets sink Titanic? Did dodgy rivets sink Titanic? In Belfast and Southhampton there have been celebrations this weekend to celebrate the 100th anniversary of the sinking of the Titanic. The last few weeks have also seen the Titanic story revisited from every angle. Last week, film maker James Cameron appeared in a National Geography documentary in which he and a team of naval engineers and historians attempted to reconstruct exactly what happened as the ship began to sink. Admirably, he concluded by admitting that the most dramatic scenes he depicted in his blockbuster 1997 movie Titanic, showing the sinking ship raised almost vertical in the water, as passengers clung to it for dear life, weren’t realistic. The ship’s incline would only have been a maximum of 23 degrees or so before it broke in two and sunk. Other analysis has revisited the collision with the iceberg and what exactly happened that cause the “unsinkable” ship to be lost in a matter of a few hours. One area of scrutiny I’m particularly interested in is the Titanic’s rivets. My great grandfather, James McClarnon (1875 – 1956), was a head rivetter on the Titanic. He worked most of his life at the Harland & Wolff shipyards in Belfast and was overseeing a team of half a dozen men or so in 1910 – 11, when the Titanic was being build. He was immensely proud of the Titanic and wept when the news reached Ireland that the ship had sunk, according to my mother. The consensus during the bulk of the 20th century was that the Titanic sunk because an attempt to turn away from the iceberg caused the ship to be hit along its side, breaching numerous watertight compartments and flooding the ship. Numerous other things exacerbated the problem – chiefly the decision to keep on sailing rather than stop the ship immediately, which only made hastened its demise. Another theory that has been floated is that the Titanic was constructed with inferior rivets and/or employed inexperienced people to rivet the ship together. Paul Holmes touched on this theory at the end of his Herald column yesterday, having seen a naval architect outline the theory in a documentary that screened on TV last week. …but [the naval architect] notes that during construction, the riveting machine was unable to get to the lower bow section so the riveting had to be done by hand. To make the work easier a slightly softer rivet was used. When the Titanic hit the iceberg the hull received about 9000kg of pressure. The rivets he made could take less than 2200kg of pressure. Adding to the problem, in buying iron for the Titanic’s rivets, the company ordered No. 3 bar, known as ’best’ – not No. 4, known as ’best-best,’ the scientists found. Shipbuilders of the day typically used No. 4 iron for anchors, chains and rivets, they discovered. Harland & Wolff, not surprisingly, dismiss the theory. They point out that the Titanic’s sister ship, the Olympic, sailed for decades without any issue with rivets failing, before being retired. Harland & Wolff, now an engineering and design firm, flatly rejects the notion that its rivets were weak. Tom McCluskie, the company’s retired archivist, points out that Olympic, Titanic’s sister ship, was riveted with the same iron and served without incident for 25 years, surviving several major collisions, including being rammed by a British cruiser. “Olympic deliberately rammed a German submarine during the First World War and cut it in half,” says McCluskie. “She was plenty strong.” The Britannic sank after hitting a mine during World War I. Both ships were strengthened after the Titanic disaster with double hulls and taller bulkheads, but their rivets were never changed. Could the Titanic have been stronger? Certainly. Higher-quality rivets or a thicker hull might have kept the ship afloat longer. But ultimately, the Titanic was designed to be a passenger liner, not a battleship. “[The ship] was built to the best of their knowledge at the time and to the proper standards. Nothing could have survived what happened to it,” says McCluskie. 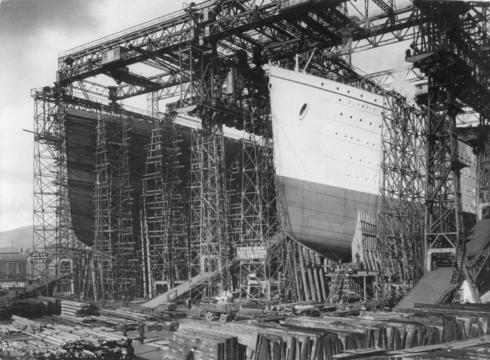 But the scientists did come across documented evidence in the ship maker’s archives of concern over the levels of rivetting expertise among the Titanic’s builders. It is hard to know what the role of the rivets in the tragedy may have been. The inferior workmanship theory has certainly been getting renewed airplay lately. We may never know for sure. But I’d love to have heard my great grandfather’s reaction to the criticism of the Titanic’s rivet jobs. He was a no-nonsense, hard-drinking ship worker, proud of and passionate about the vessels he worked on. One thing is for sure, whoever questioned his rivetting skills would have definitely got short shrift from him!